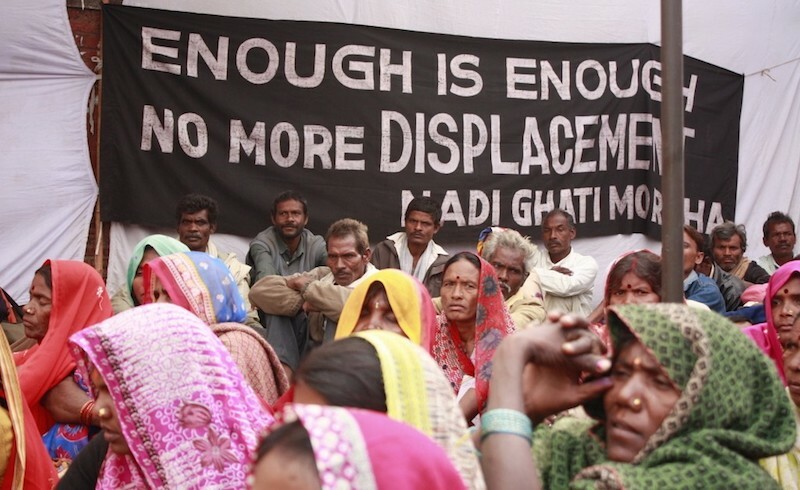 Indian farmers protest displacement, January 2015. Photo: National Alliance of Peoples Movements. Far right political forces have burgeoned throughout the world, but only in India does a far right party, the Bharatiya Janata Party (BJP), hold governmental power on its own. Nor anywhere else is there a far-right force, with obvious fascist characteristics, that has existed now for over 90 years. The BJP is the electoral wing of the group called the Sangh Parivar, with well over a hundred affiliates, including cultural, religious, student, women and federated trade union fronts, whose original parent body is the Rashtriya Swayamsevak Sangh (RSS). The Sangh is fully committed to the project of establishing a Hindu state/nation as the "true" embodiment of nationalism. The scale and depth of its implantation in the pores of civil society is unmatched. Across India, the RSS has over 56,000 branches and an estimated membership between five to six million. How this came to pass certainly involves global developments, such as the rise and spread of a neoliberalism that has had devastating economic consequences, as well as creating new and more powerful forms of social disorientation and alienation. In such circumstances, people seek psychological refuge in clinging to "unchangeable" ascribed identities of ethnicity, religion, race, caste, and nation, either separately or in combination. Exclusivist and authoritarian populist nationalisms take hold. However, the effect of neoliberal globalization is always mediated by national histories and specificities. In India, this has resulted in the rise of the Sangh and its expanding ideology of Hindutva or Hindu nationalism with its foundational hatred of Islam and Muslims, who constitute 14% of the country’s population. Today the BJP has replaced the Congress party (now in serious decline) as the only national party in electoral terms, while in the competitive struggle to establish hegemony, compared to all other forces, Hindutva is in the lead although still well short of its ultimate goal. Given this reality, the struggle to defeat communalism must necessarily fight on all fronts — cultural, political, ideological, and economic. And it is the economic front, especially in the agrarian sector, which is currently the Sangh’s weak spot. Agriculture contributes only 14% of GDP and only 40% of all rural output with micro-, small, and medium enterprises of all sorts (services, manufacturing, construction) counting for the rest. But even here output growth far outstrips employment growth. Two-thirds of the total population is from rural India with one-quarter being landless. Here there is a strong overlap between lower classes and lower castes: for example, a near majority of Dalits are landless but a majority of landless are not Dalits. This situation calls out for cross-caste/class alliances. Yet the main Dalit organisations and parties focus on affirmative action and identity politics. Only very recently has a young lawyer and Dalit leader, Jignesh Mevani, emerged, who is insisting on going beyond identity politics, demanding not just land redistribution but jobs for all the poor. This pleases neither upper caste farmers nor urban dwellers, while disturbing existing Dalit leaders. Around 80% of all the landholdings of Indian farmers are small or marginal. Even the 20% of rich and medium-sized farmers feel disempowered, although they dominate rural politics, providing leadership for many, though not all, rural struggles, such as low caste mobilizations against upper caste atrocities and discrimination. Over two-and-a-half decades Indian agriculture has suffered a serious decline. The key trends are rising costs of inputs despite some subsidies, growing indebtedness (52% of all farmers are in debt), increasing subdivision of land, declining output prices from global competition and greater corporatization of value chains between farm and retail. Agriculture growth is not only insufficient, it is also jobless, while land acquisition for defence, infrastructure projects, real estate and industrial corridors has created uprisings against the government’s pro-urban bias. Agrarian mobilizations have been against land acquisition, for jobs/support prices/debt relief and amenities. In the last 25 years around 300,000 farmers committed suicide with around 270,000 doing so in the last 15 years. Apart from the struggles against caste oppression most others have been led by the rich peasantry whose distress has led many to look for exit in due course and certainly for their progeny. According to the 2017 Annual Status of Education Report only 1.2% of youth from whatever backgrounds are willing to work in agriculture. It is no surprise, then, that such upper caste farmers’ movements are now demanding reserved places for themselves in secure government jobs. A big contrast to the 1990s when reservation was extended to the middle castes (around 50% of the population and also called Other Backward Classes or OBCs) as well as to Dalits (15%) and Tribals (8%), provoking an angry upper caste reaction. Does this mean that the hegemonic ambitions of Hindutva forces and their anti-democratic project are being seriously challenged by such agrarian discontent? Things are not so straightforward. The agrarian bourgeoisie comes mainly from the upper non-Brahmin castes and from the upper echelons of the OBCs. Most are not opposed to Hindutva ideology; indeed the main social base for the Sangh is from these castes. Indeed, recently there has been a substantial Hindutva-isation of OBCs, as well as some in-roads into Dalits and Tribals. The promise of cultural upward mobility as a result of joining the broader Hindu fold has served as a psychological balm of sorts. But this rural bourgeoisie feels it has lost out at the apex of society to its urban industrial, service sector, and financial counterparts. What lessons can be drawn? A major focus of the struggle against rising Hindu authoritarian populism must be opposition to neoliberal economic policies. Yet all but the Left parties are wedded to a neoliberal position. A new programme must be worked out for environmentally sustainable development to meet employment, health and welfare needs for the vast majority. The Left and other progressive forces must also link the struggles of lower castes, women, tribals in all their variety, to the class struggles of all the working poor, perhaps especially in rural areas. To defeat populist-nationalist forms of communal authoritarianism we have to fight against more than just communalism!